Welcome to the website of the KEY-VOCs project! This three year project was launched on the 1st of October 2014 and it ended on the 30th of September 2017. KEY-VOCs was part of the European Metrology Research Program and it received European funding. Together with VSL, the project coordinator, another 9 EU National Metrology Institutes and 3 Researchers Excellence Grants worked side by side in research activities related to air quality and to atmospheric monitoring. so that the air monitoring networks could improve the reliability and comparability of the measurement results and get a better understanding of the gas sensing devices potentials. Click here to read the final KEY-VOCs project summary and the final report. Interested in receiving more details on the project and project results? By registering, you have access to further information posted on this website. I wish you good reading and I hope you will continue following our work in the future! Go to impact to read the KEY-VOCs Final Report ! 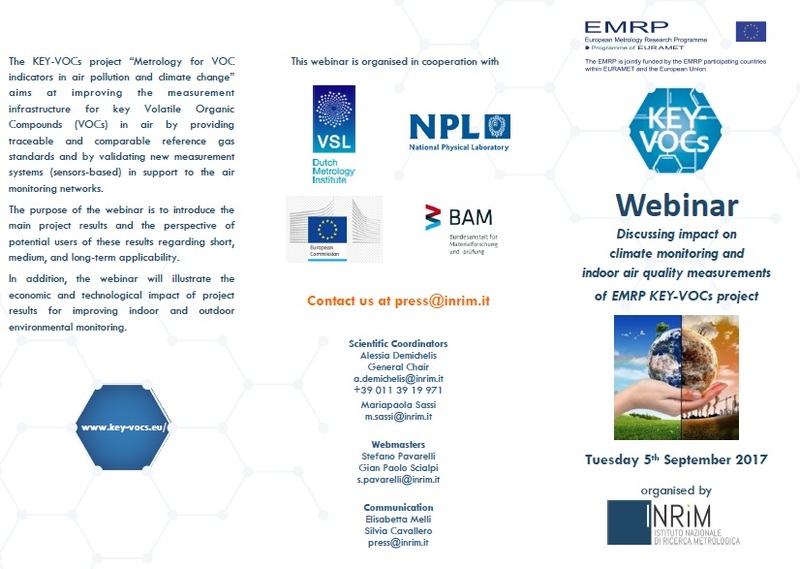 The presentations of the KEY-VOCs Webinar (5 September 2017) are NOW available on INRiM website ! OPEN Access to publication L. Spinelle et al, "Review of portable and low-cost sensors for the ambient air monitoring of benzene and other VOCs"
The presentations of the KEY-VOCs Workshop Indoor Air are NOW available! Best Poster Award for A. Baldan et al. "Development of Oxygenated VOC gas standards to underpin atmospheric monitoring" at "GAS Analysis 2017", Rotterdam, The Netherlands, June 13 - 15, 2017! Become member of the new VOC Measurements LinkedIn group and share your discussions with us!